University of Lynchburg will host a screening of the documentary “Evolution of America: 1619 to Today” at 7 p.m. Monday, October 22, in Hopwood Auditorium. The event is open to the public and admission is free. 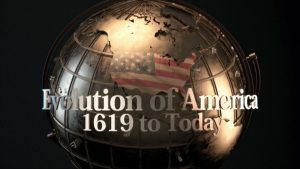 The hour-long documentary explores the history and events of 1619 Virginia and how that decisive year affected the growth and development of America. The year 1619 was a pivotal year in the establishment of the first permanent English colony in North America, the first representative legislative assembly in the New World, the arrival of the first recorded Africans to English North America, the recruitment of English women in significant numbers, the first official English Thanksgiving in North America, and the entrepreneurial and innovative spirit of the Virginia colony. The documentary screening is one of numerous events planned at the University of Lynchburg over the next year in conjunction with American Evolution, Virginia to America, 1619 to 2019. The series of events, legacy projects, and initiatives celebrates the 400-year history of the Commonwealth of Virginia. American Evolution commemorates the ongoing journey toward the key ideals of democracy, diversity, and opportunity. Lynchburg is a higher education partner of the commemoration. You can watch the “Evolution of America” trailer here. For more information about this and other American Evolution initiatives, visit the American Evolution website.